4Gs have been blessed with a partnership with The Bookshelf, a wonderful independent bookstore in downtown Guelph. We sell the books and puppets at events where we feature a market table. The Bookshelf donates 20% of the sales to the Guelph GoGo Grandmothers which is donated to the Grandmothers to Grandmothers Campaign (G2G) of the Stephen Lewis Foundation. This has been a great partnership since the birth of 4Gs in 2006. Here, 4Gs member Sya VanGeest explains how this partnership works. We have a Lending Library of selected African picture books and puppets. 4Gs are encouraged to borrow these to familiarize themselves with the books, share them with children, practice for readings in schools and community groups, and be part of 4Gs Griots. Most of the items were donated by generous 4Gs members. A core collection was purchased out of our operating budget. 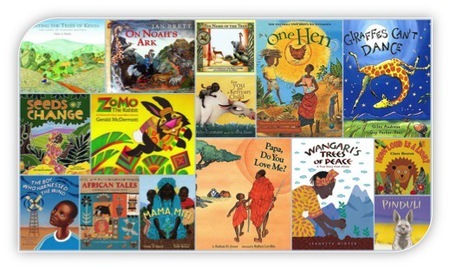 There is a bounty of wonderful African stories available in picture books. The current tragic events unfolding on the continent, particularly the ongoing toll of the HIV/AIDS pandemic, may overshadow the beauty that is Africa, especially the rich legacy and the current vibrancy in the arts, including the splendour of story. Some of these tales are shaped for the ear and show their rich oral tradition that gave birth to them. Others are new tales set in lush African settings or use African animals and people. Some introduce children to African heroes. All are beautifully illustrated representing unique blends of sophisticated lively art that enrich the stories. This is an eclectic selection of quality picture books. Although they are picture books, do not let that fool you into thinking they are only for children. Each is entertaining, explores broad themes and speaks about important issues for all ages. · Aardema, Verna. Illus. by Leo and Diane Dillon. Why Mosquitoes Buzz in People’s Ears. New York: Dial, 1975. Mosquito tells tall tales that lead to upsetting consequences. Beautiful, bold art. Caldecott Award winner. Excellent to shape for the ear for storytelling. · Andrede, Giles. Illus. by Guey Parker-Rees. Giraffes Can’t Dance. New York: Orchard, 1999. · Brett, Jan. On Noah’s Ark. New York: Putman, 2003. A fun creation of Noah’s Ark using African animals and people by renowned artist and storyteller. The familiar tale is told from the unique perspective of Noah’s granddaughter. · Cannon, Janell. Pinduli. San Diego: Harcourt, 2004. Pinduli’s mama tells her that she is the most beautiful hyena but the other animals on the African savanna disagree and mock her apprearance. When Pinduli tries to disappear she triggers surprising events. A heart-warming story about self-acceptance and how what we say to others matter. · Cunnane, Kelly. Illus. by Ana Juan. For You Are a Kenyan Child. New York: Atheneum, 2006. A Kenyan boy is distracted from watching his grandfather’s cows by playing and visiting his neighbours. Wonderful sense of community life. Wonderfully illustrated! Fullerton, Alma. Illus. by Karen Patkau. A Good Trade. Pajama Press, 2012. Kato makes his daily barefoot trek to the village well. When he sees the aid-worker’s truck with a wonderful gift he searches to give a gift in return. Pictures compliment and add information to the story. · Haley, Gail E. A Story, a Story: An African Tale Retold. New York: Aladdin, 1970. Once, there were no stories on earth to tell. Ananse spins a web up to the Sky Kingdom and sets out to pay the price for the stories. Perfect story to shape for telling. Caldecott Award winner. · Krebs, Laurie. Illus. by Julia Cairns. We All Went on Safari: A Counting Journey through Tanzania. Barefoot Books, 2004. · Kroll, Virginia. Illus. by Katherine Roundtree. Jaha and Jamil Went Down the Hill: An African Mother Goose. Charlesbridge, 1995. The charming rhymes and rhythms of Mother Goose are maintained in their transfer to characters and settings of 28 African countries. Colourful illustrations. · Joose, Barbara. Illus. by Barbara Lavallee. Papa, Do You Love Me? San Francisco: Chronicle, 2005. 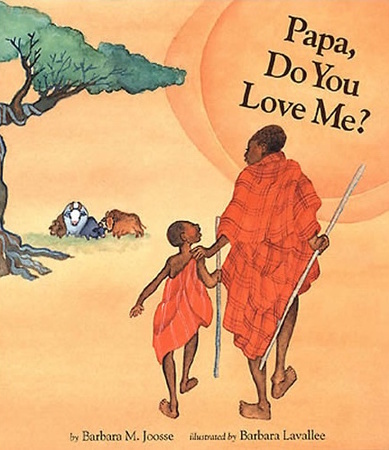 A tender story assures a child that indeed his papa loves him no matter what. His Papa will teach him, protect him, and love him,always, "For you are my tender heart". Highly recommended for every father! The art brings life to the beauty of Africa. With Glossary. · Lottridge, Celia Barker. Illus. by Ian Wallace. The Name of the Tree: A Bantu Tale Retold. Toronto: Groundwood, 1989. When the rains do not come, a terrible famine sends the animals searching for a place where there is enough for all. Magical story and pictures. Great to shape for the ear. Canadian artist Ian Wallce captures the mood and setting. · McDermott, Gerald. 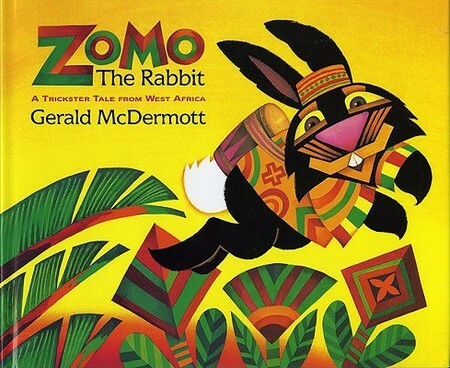 Zomo the Rabbit: A Trickster Tale from West Africa. New York: Harcourt, 1999. Zomo the Rabbit wants more than clever. He wants wisdom. But the price for wisdom is three “impossible” things. His pursuit makes for a lovely story to read aloud or shape for the ear for telling. Stunning, bold illustrations. · Mhlophe, Gcina. Illus. by Rachel Griffin. African Tales. Barefoot Books, 2009. 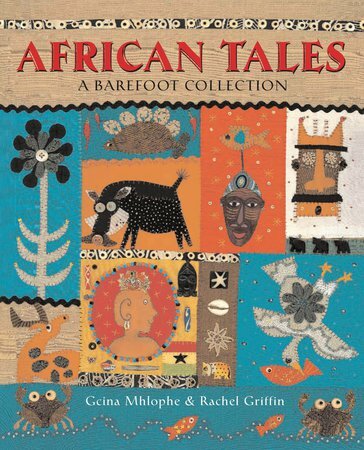 A collection of eight folktales from different regions of Africa, each prefaced with a double-page spread about the country of origin. Includes a map of Africa and facts about the continent. The bold, coloured pages and rich art is an integral part of this beautiful book. · Milway, Katie Smith. Illus. by Eugenie Fernandes. One Hen: How One Small Loan Made a Big Difference. Toronto: Kids Can, 2008. 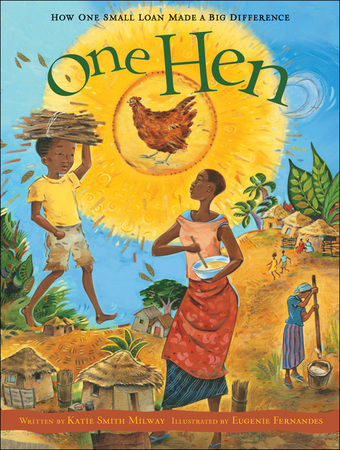 Inspired by true events, One Hen tells the story of Kojo, a boy from Ghana who turns one hen into a thriving farm. Endnotes tell the true life of Darko, who started a trust giving small loans to those who could not get a bank loan. 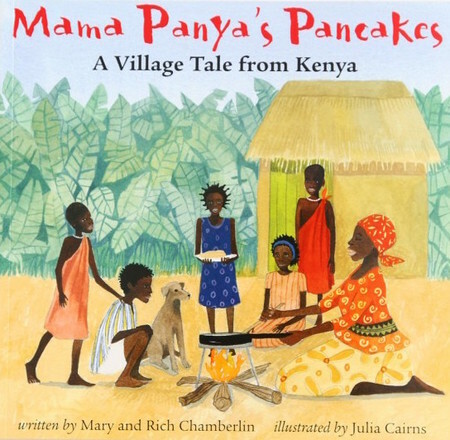 · Tell Children about Wangari Maathai. 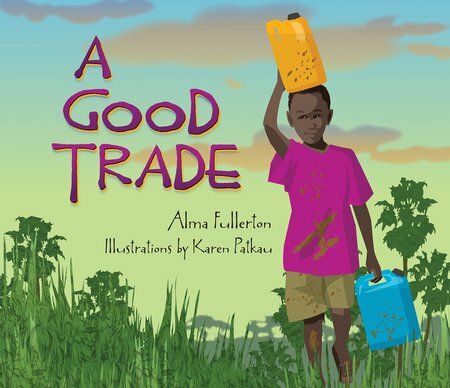 Four beautiful picture books introduce children to a remarkable woman, Dr. Wangari Maathai. As a young girl in her small rural village in Kenya, she learned to love and respect nature. Her story is a shining example of how one girl's passion, vision, and determination inspired great change in spite of obstacles and hardships. Dr. Maathai won the Nobel Peace Prize in 2004, the first environmental activist and African woman to do so. She died in 2011 at the age of 71. She remains an inspiration for environmental action for children. This display board was created by creative, generous granddaughter, Ieva. Ieva travelled to Lesotho as part of a Guelph high school leadership project. and continues to assist her 4Gs grandmother in her work for African gogos. Thank you Ieva and all our families who support our work in multifarious ways!